Below are all back issues of Tasty & Healthy Nuggets, which you can subscribe to from this site. <!-start repeat --> October 19, 2013 -- Tasty & Healthy Nuggets, Issue #005. To eat, or not to eat wheat! August 30, 2013 -- Tasty & Healthy Nuggets, Issue #004. The raw truth! July 10, 2013 -- Tasty & Healthy Nuggets, Issue #003. Eat fat - it's good for you! June 13, 2013 -- Tasty & Healthy Nuggets, Issue #002. Are you getting enough iron from the food you eat? May 29, 2013 -- Tasty & Healthy Nuggets, Issue #001 -- Slow down if you want to lose weight. My spirulina and baobab smoothie might not have the looks but it's jam-packed with nutrients and tastes surprisingly good. 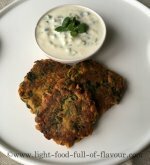 Asian-style vegetarian food - delicious spicy Indian fritters with sweet potatoes and spinach. 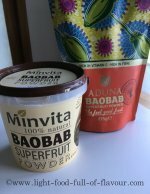 You might not have heard of this fruit before but super-healthy baobab fruit is possibly the healthiest of them all. Copyright © 2012-2018 www.light-food-full-of-flavour.com. All rights reserved.